Jack Davies writes about the London Symphony Orchestra's upcoming performance of Aaron Copland's Quiet City next Tuesday 11th June. The orchestra will be conducted by American conductor Michel Tilson Thomas, features Yo-Yo Ma playing the Shostakovich Cello Concerto No 2, and Benjamin Britten's Prince of the Pagodas - Suite. 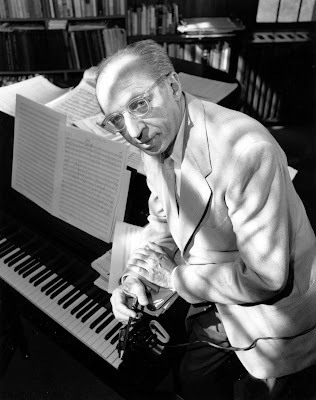 "In the age of le jazz hot, he composed le jazz triste", writes David Schiff of Aaron Copland. It is an often overlooked fact that Copland's music carries in it a jazz tinge. Schiff argues that Copland developed his own melancholic voice as an echo, if not a direct emulation of the blues. Copland never claimed to be a jazz musician, but he did say "I can't play jazz, but certainly I was familiar with it - sufficiently so it would have made a deep impression." The academic Stanley Kleppinger notes that Copland recognised the importance of jazz in giving American classical music a unique voice. However, Schiff argues that Copland's attitude to jazz was often condescending, suggesting his view was coloured not by New York's fermenting contemporary music, but rather popular rags and novelty songs. Schiff unflatteringly describes Copland's attitude to jazz musicians: "jazz musicians, like native populations are found to only have unconscious qualities." However, Copland's post-Debussy harmony, combined with his own impression of jazz, feels in some ways like an ancestor of Gil Evans. Copland himself, perhaps unconsciously, absorbed some of jazz's mood and energy. For Copland, it was rhythm, not harmony that defined jazz. He wrote: "the essential character of jazz is its rhythm." One of the 'jazz rhythms' Copland identified, crudely, in his own writings is a dotted ostinato. This is a recurring idea in Quiet City, almost becoming a leitmotiv for the 'city' itself. Copland originally wrote the piece as a score for an Irwin Shaw play. The stage work was so cumbersome and over-complicated that it died soon after its conception, leaving Copland to rework the music he wrote into the now familiar orchestral piece. Copland's choice of the trumpet as the solo voice is dictated by stage direction: the play's central character has an alter-ego brother who is a jazz trumpet player. Shaw dictates: "The horn is muted, [.] restless, dying." For me, Quiet City is a study of urban melancholy and loneliness in the same vein as Copland's contemporary Edward Hopper. The piece perfectly evokes the paradox of being solitary in a city. The cold trumpet call entry feels a natural companion to Miles Davis' vibrato-less, fragile tone, and is every bit as affecting. Quiet City is a study in noire, almost two decades before Miles recorded Acenseur pour l'échafaud. The piece is his own impression of jazz - an impression that has proved to be oddly prophetic. The London Symphony Orchestra perform Quiet City next Tuesday 11th of June at the Barbican.